The image for Day 314 of the VM_365 project is of examples of pottery fabrics dating from the Mid Saxon period, spanning the mid 8th to the mid 9th century. Pottery in Kent and elsewhere in this period was mostly handmade, with small bag-shaped vessels with everted rims most common. Some had their rims more neatly and evenly finished by turning the pot on a tournette, a stick or hand-turned wheel. In East Kent two main fabric types were employed; sandy ware and shelly ware, the latter sometimes with some additional sand added. Most of the the Mid Saxon sandy ware products were made at sites near Canterbury, beginning a nearly 900-year long period of continuous pottery manufacture in these workshops. The two left hand rim fragments in the image are from cooking jars in Canterbury sandy ware fabrics. A small everted rim cup in a similar dark grey sandy ware fabric featured in the post for Day146 of the VM_365 project. The larger rim at the right-hand end of the picture is from a larger vessel in shelly ware. The small plates of deliberately crushed shell are just visible on the surface of the sherd. All of the sherds shown can be dated to a period between c.750-850 AD which is currently rarely represented in Thanet’s archaeological record. The relative scarcity of pottery of this period is partly due to the fortunes of archaeological recovery. Few sites have been found in Thanet’s rural and coastal landscape and all the sherds shown as well as the cup in the earlier post were from a single site near Westgate. Much of the occupation in this period will have been masked by later medieval settlement and dwellings will have been mainly wooden structures which can be hard to detect. 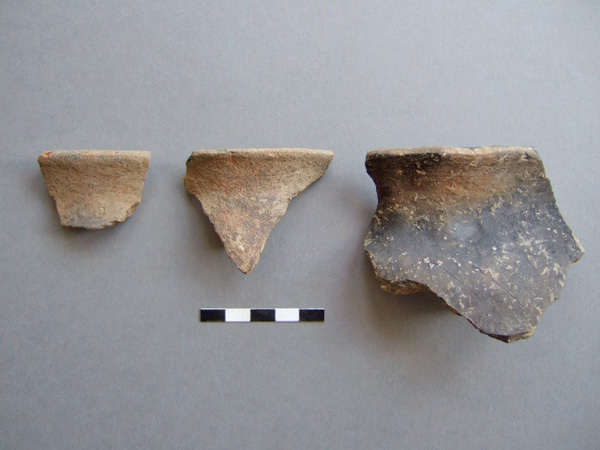 The rather low-fired pottery is vulnerable to damage from modern agricultural or building activity. The information and images for this post were kindly provided by Nigel Macpherson Grant. The image for Day 277 of the VM_365 project shows a bone awl found in a late 8th-9th century pit at Westgate during excavations in 2006. At first glance this object is very similar to an Iron Age cloak pin that accompanied a burial in a pit at Dumpton. However, when you look closely at this artefact you can see that it has been carved from a much lighter weight bone from a large bird, possiby a duck, and the end has been purposely carved to a fine, sharp point rather than a rounded end as the cloak pin has been. The awl is also flat on either side rather than having a rounded profile. So what would the awl have been used for? It would seem likely that this would have been made for piercing holes in hides or leather, perhaps for making shoes, bags and pouches. The flattened profile would allow the user more purchase when turning the awl to create a hole in a hide. The hole pierced through the end of the awl was probably used to attach the awl to a belt or perhaps to allow it to be hung up so that it was easily to hand while working leather. Another object used in the manufacture of cloth have also been found on the site, a beautifully carved and well used pin beater featured on Day 144 of the VM_365 project. 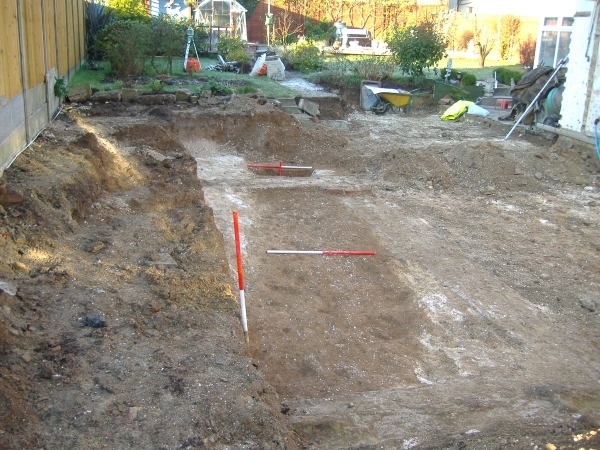 Segment excavated through Bronze Age Barrow at Westgate in 2011. Scale shows 0.5m increments. Today’s image for Day 271 of the VM_365 project shows a segment excavated through a well preserved ring ditch surrounding an Early Bronze Age barrow during an archaeological evaluation carried out at Westgate in 2011. The location of the barrow ditch, with a diameter of approximatley 27 metres, had been identified by aerial photography. 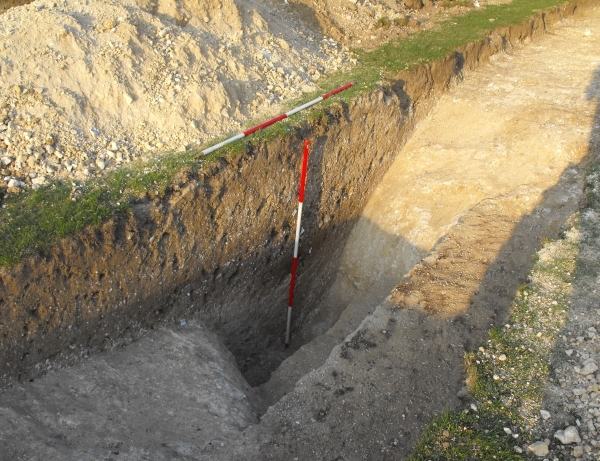 The evaluation established that the well preserved profile of the ditch was cut into the chalk geology to a depth of 1.4 metres from the base to the interface with the subsoil. Although the section shown in the image is cut slightly obliquely across the width of the ditch it gives a good impression of its large dimensions. At its widest point across the top the ditch measured 2.3 metres; the flat base was 1.3 metres wide. A mound would have been built from the soil and chalk taken out of the ditch to cover a burial in a grave at the centre of the barrow. The ditch profile near the flat base was very steep sided, but the angle of the upper edges of the cut sloped more gently, creating an angled shoulder on the inner edge of the ring ditch. The limits of the shoulder allow us to estimate the diameter of the mound as a maximum of 22 metres and its possible original height as around 10-11 metres, assuming that the sides had as much as a 45 degree slope when it was originally built. Soil compression and slipping of the edges would have quickly reduced the height and angle of the mound unless it had been carefully compacted or structured in some way. As the grave of a significant individual in the Early Bronze Age, we assume that the ditch was kept clear and that the mound was maintained to some degree, preserving its height and function as a monumental marker in the landscape. When it was abandoned the chalky covering of the mound began to erode into the ditch, filling the base with clean chalky material. Later more silty deposits accumulated in the hollow left by the ditch, derived from the soil that formed over the mound and the surrounding landscape. It is often assumed that the decaying mound and ditch would have been a significant feature in the landscape, attracting later communities to reuse it for burisls and as a significant feature in the landscape. It is not often that the survival of a barrow mound or ditch can be dated. However the silty deposits that made up the upper fills of this barrow ditch contained abundant fragments of pottery, dating from as early as the middle Iron Age to the Roman period, in the 3rd century AD. This dateable material indicates that the hollow of the ditch remained a prominent feature, accumulating debris from nearby settlements many centuries after its builders and their successors had stopped looking after the monument. How visible this feature was in the later Roman, Saxon and medieval periods we will never know as the most significant erosion suffered by the ring ditch and mound probabaly resulted from agricultural activity in the early 20th century and the eventual levelling of the site for recreational use. The image for VM_365 Day 146 shows a mid Saxon handmade jar and its illustration from a site near St Mildred’s Bay, Westgate which was excavated in 2006. The small handmade jar has an everted-rim and is made in a rough patchy grey/black fabric with a hard ‘gooseflesh’ finish. It is encrusted internally with lime. The external rim diameter measures 100mm. 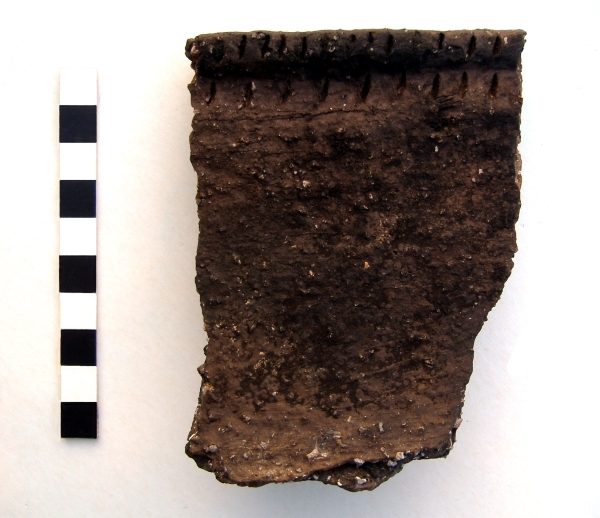 It is an example of an ‘Ipswich’ type ware, characteristic of c.AD.750/75-850 dated assemblages from East Kent. The jar was found in the same pit as the large fragments of daub shown in Day 145’s article. VM_365 Day 145 Mid Saxon clay daub from Westgate. Today’s image for Day 145 of VM_365 shows one of the large fragments of daub which was excavated from a mid Saxon site near St Mildred’s Bay, Westgate in 2006. The picture on the left shows a fragment of daub measuring approximately 15 cm high and you can clearly see the impressions left in the daub from the wooden rods and sails which formed the structure that it covered. The picture on the right is a reconstruction of where the rods and sails would have been placed, using similar diameter pieces of wooden dowel. These fragments of daub were redeposited in a pit and mixed with a dark grey sooty soil, there was no evidence for an in situ structure. This deposit of daub appears to be from a demolished structure used to fill this pit, possibly used as packing to create a post pad or platform. Other finds from this pit included burnt chalk, burnt flint, animal bone and five sherds of pottery from the same small handmade jar. We do not know what the original structure would have been but it could have been part of an oven or kiln. The image for Day 144 of VM_365 is of a bone double ended pin beater found in the fill of a pit at a small middle Saxon site excavated near St Mildred’s Bay, Westgate in 2006. Pin beaters were used to beat down threads while using a warp weighted loom. The pin beater is made of bone or ivory and measures 121 mm long, 3mm at its narrowest point at the end and 8mm at its widest point at the centre. It has an ovoid, slightly flattened profile and has been polished through use to a very smooth and glossy finish. Both ends have been carved to form a point. This pin beater was found in the fill of a rectangular pit along with fragments of burnt daub, animal bone and marine shell, as well as a single pottery sherd from a jar dating between 450-700 AD. Other finds from the same site included large fragments of burnt daub with rod and sail impressions and an iron lock mechanism possibly from a chest or casket.